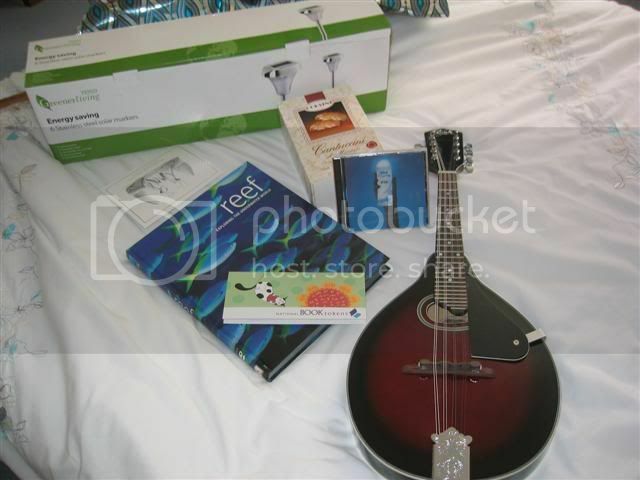 Trish decided I should have a mandolin for my birthday. I didn't even know the tuning - G-D-A-E, Google tells me. yeah, it's tuned in fifths rather than fourths like guitar/bass. same tuning as a violin. I welllllllllll want a mandolin or a banjo, I'd just cheat and tune it to a guitar though, if only to begin with. The box at the back? Six solar-recharging white LED lamps on stakes ("solar markers") for the garden. From my mother-in-law, but I simply can't think how to use them. I don't hang about in the garden after dark generally because of little biting flying things, and I think they'll just get in the way of mowing the lawn if I put them along the path edge. If I put them on the front lawn they'll just get nicked. No need its tuned like an upside down guitar, just flip them chords upside down. I spent about 2 hours learning chords until I suddenly realsied I was just playing upside down guitar chords for most of them. i love playing mandolin, but mine's broken so it only intonates with a capo on fret 2. still wicked fun to play Going To California and Losing My Religion. but that's it though.